Please join us for a color-coded cocktail soirée and the premiere of Tornado Kit (2014) by artist Claudia Comte. 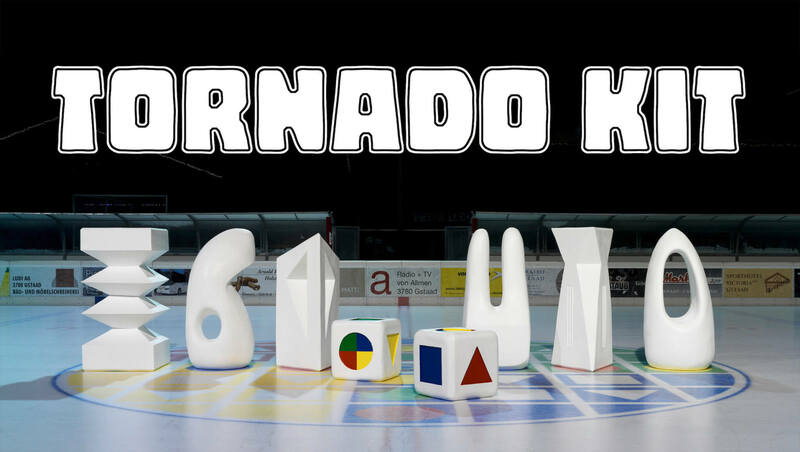 Tornado Kit is a comic universe, populated by real-life hockey players who glide around a fictional board game, which was installed last year on the central ice rink in Gstaad, Switzerland as part of Elevation 1049. While pushing around massive sculptures, the players dance across the ice field guided by the shouted commands of a computer-generated voice. The evening at Swiss Institute will unfold according to the rituals, choreography and aesthetics of color field painting and strategy games, in which human-scaled objects become pawns in activating their own function as sculpture. RSVP essential to rsvp@swissinstitute.net. Capacity is limited and priority given to Friends of Swiss Institute and members. Join here! Claudia Comte was born in Grancy, Switzerland, and now lives and works in Berlin. Her work has been shown in solo exhibitions at Haus Konstruktiv, Zurich, Switzerland; Centre Culturel Suisse, Paris; and the Swiss Institute of Rome, Rome. She has also been included in group exhibitions at Kunsthaus Glarus, Glarus, Switzerland; Aargauer Kunsthaus, Aarau, Switzerland; Elevation 1049, Gstaad, Switzerland; and at SALTS, Basel, Switzerland.